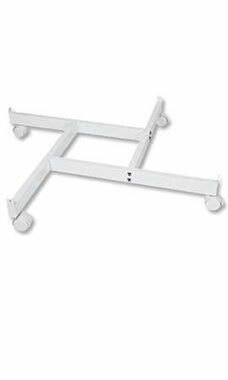 Create an instant stand alone 4-sided unit with our White 4-Way Base with Casters. Wire grid panels rest on top of a unique 4-way square base that turns regular wire grid panels into a portable display that rotates. Display fixtures can be added to enable merchandise to be seen on four sides. Each 4-Way Grid Base is 36"L x 36”W. Additional wire grid fixtures and shelving can be added to complete your display.